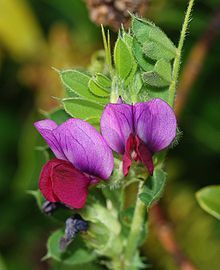 Vicia sativa, known as the common vetch, garden vetch, tare or simply vetch, is a nitrogen-fixing leguminous plant in the family Fabaceae. Although considered a weed when found growing in a cultivated grainfield, this hardy plant is often grown as green manure or livestock fodder. Vicia sativa is a sprawling annual herb, with hollow, four-sided, hairless to sparsely hairy stems which can reach two meters in maximum length. The leaves are stipulate, alternate and compound, each made up of 3–8 opposite pairs of linear, lance-shaped, oblong, or wedge-shaped, needle-tipped leaflets up to 35 millimetres (1.4 in) long. Each compound leaf ends in a branched tendril. The pea-like flowers occur in the leaf axils, solitary or in pairs. The flower corolla is 1–3 centimetres (0.4–1.2 in) long and bright pink-purple in colour, more rarely whitish or yellow. The flowers are mostly visited by bumblebees. The fruit is a legume pod up to 6 or 7 centimeters long, which is hairy when new, smooth later, then brown or black when ripe. It contains 4–12 seeds. Sown for fodder, the seed is sown densely, up to 250 kg per hectare. However, when grown for seed, less seed should be used; otherwise the crop will be too thick, reducing flower and seed production. When meant for seed, sowing is done early in the planting season for good returns; but, when for green manure, any time in spring is suitable. Sometimes, a full crop can be obtained even when sown as late as summer, though sowing so late is not recommended. After the seed is sown and the land carefully harrowed, a light roller ought to be drawn across, to smooth the surface and permit the scythe to work without interruption. Also, the field should be watched for several days to prevent pigeons from eating too much of the sown seed. Horses thrive very well on common vetch, even better than on clover and rye grass; the same applies to fattening cattle, which feed faster on vetch than on most grasses or other edible plants. Danger often arises from livestock eating too much vetch, especially when podded; colics and other stomach disorders are apt to be produced by the excessive amounts devoured. Cereal grains can be sown with vetch so it can use their stronger stems for support, attaching via tendrils. When grown with oats or other grasses, the vetch can grow upright; otherwise its weak stems may sprawl along the ground. Several cultivars are available for agricultural use, and as for some other legume crops, rhizobia can be added to the seed. Pests that attack this crop include the powdery mildew fungus Erysiphe pisi, the pea aphid Acyrthosiphon pisum, the corn earworm (Heliothis zea), the fall armyworm (Spodoptera frugiperda), and spider mites of genus Tetranychus. During the early 20th century, a mutant of the common vetch arose with lens-shaped seeds resembling those of the lentil, leading to vetch invasions of lentil fields. D. G. Rowlands showed in 1959 that this was due to a single recessive mutation. The transition from traditional winnowing to mechanised farming practices largely solved this problem. Common vetch has long been part of the human diet, as attested by carbonised remains found at early Neolithic sites in Syria, Turkey, Bulgaria, Hungary and Slovakia. It has also been reported from Predynastic sites of ancient Egypt, and several Bronze Age sites in Turkmenia and Slovakia. However, definite evidence for later vetch cultivation is available only for Roman times. ^ van der Kooi, C. J.; Pen, I.; Staal, M.; Stavenga, D. G. & Elzenga, J. T. M. (2015). "Competition for pollinators and intra-communal spectral dissimilarity of flowers" (PDF). Plant Biology. doi:10.1111/plb.12328. ^ Blamey, M.; Fitter, R. & Fitter, A. (2003). Wild flowers of Britain and Ireland: The Complete Guide to the British and Irish Flora. London: A & C Black. p. 142. ISBN 978-1408179505. ^ Stace, C. A. (2010). New Flora of the British Isles (3rd ed.). Cambridge, UK: Cambridge University Press. p. 159. ISBN 9780521707725. ^ Hackney, P., ed. (1992). Stewart and Corry's Flora of the North-east of Ireland (3rd ed.). Queen's University Belfast. ISBN 0-85389-446-9. ^ a b c The Household Cyclopedia of General Information. New York: Thomas Kelly. 1881. p. 47. ^ Fred Gould (1991). "The evolutionary potential of crop pests" (PDF). American Scientist. 79 (6): 496–507. Bibcode:1991AmSci..79..496G. ^ Cope, T.; Gray, A. (2009). Grasses of the British Isles. BSBI Handbook No. 13. London: Botanical Society of Britain and Ireland. ISBN 9780901158420. ^ "Vicia sativa L." The Plant List. Retrieved 24 March 2017. Wikimedia Commons has media related to Vicia sativa. "Vicia sativa". Germplasm Resources Information Network (GRIN). Agricultural Research Service (ARS), United States Department of Agriculture (USDA). This page was last edited on 23 March 2018, at 02:19 (UTC).